IQMS uniquely combines ERP and manufacturing execution system (MES) functionality to give manufacturers a comprehensive end-to-end suite for running the business, backed by the real-time performance and scalability that companies demand. Developed specifically for mid-market repetitive, discrete and batch process manufacturers, IQMS provides robust capabilities for addressing strict customer and regulatory certification and compliance. We achieve this by delivering traditional ERP functionality for accounting, sales orders, material requirements, inventory and purchasing, plus extended native features for CRM, human resources, production scheduling, shop floor control, warehouse and quality modules. With offices across North America, Europe and Asia, IQMS serves manufacturers around the world. Our corporate headquarters are located at the Southern tip of California’s Silicon Valley. We have additional offices in Pleasanton (CA), Chicago, London, Mexico City, Shenzhen, Sweden and Toronto. We are an equal opportunity employer that is committed to inclusion and diversity, including minorities, women, veterans and individuals with disabilities. IQMS customer references have an aggregate content usefulness score of 4.6/5 based on 907 user ratings. IQMS reviews and testimonials from 37 real customers and users. 29 companies using IQMS share their challenges, decisions and results before, during and after implementing IQMS software. Watch and listen to 16 featured customer videos describing how they use IQMS inside their companies. "IQMS is a cornerstone in our culture of success. Because EnterpriseIQ touches every aspect of our bus..."
IQMS is a cornerstone in our culture of success. Because EnterpriseIQ touches every aspect of our business and is so easy for anyone to use, it has allowed us to weave our quality system and continuous improvement practices permanently into the fabric of our organization. Now our shop floor operators and other employees can see instantly how their efforts impact the bottom line, so every one of our employees is as invested in the company’s success as I am. We look forward to the future technology IQMS can provide because we know it will enable us to deliver ever-greater results for our customers for many years to come. 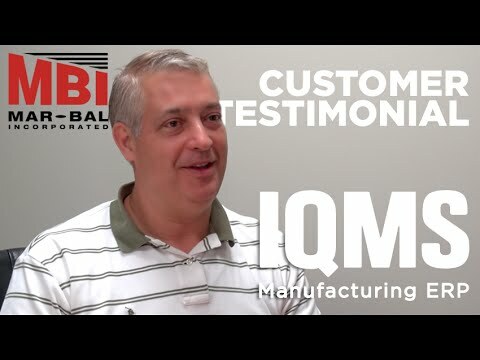 82 IQMS Testimonials & Customer References from real IQMS customers. Watch IQMS Customer Videos, Testimonials & Customer References to decide if IQMS has the right business software or service for your company. See which companies are customers of IQMS. We monitor all 82 customer references & reviews to prevent fraudulent content. We only post customer references verified by the vendor.